Premium weight black hoody with contrasting red inner hood. Embroidered with USWSU logo on front left chest and sponsors logo on left sleeve. 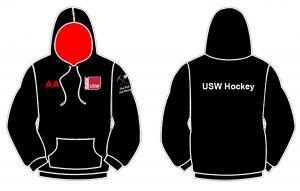 "USW Hockey" printed white across back. Optional personalisation of initials only printed on front right chest in red.